Several student and administrative organizations joined together to paint a positive message: "all Vols belong." 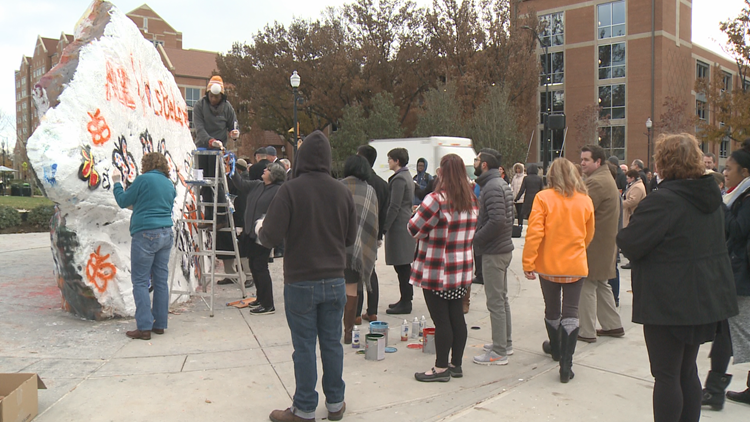 Dozens of University of Tennessee students gathered on campus to paint the rock Wednesday as a stand against hate speech. There have been several instances of hate speech painted on the rock this semester. Organizers said it was encouraging to see so many people turn out to support their mission. "In the age of social media, it's easy to push a share button, but to come out is a little more difficult so it's exciting to see this going viral in a physical sense," Sarah Frankel, who helped organize it, said. Students said it was a good way to show people that UT is standing together against hate speech.